Turkish Energy Minister Taner Yildiz called the explosion at the Baku-Tbilisi-Erzurum pipeline in Turkey a "diversion." ANKARA (Sputnik) — The explosion at the Baku-Tbilisi-Erzurum pipeline in eastern Turkey was a diversion by Kurdistan Workers’ Party (PKK) militants, Turkish Energy Minister Taner Yildiz said Tuesday. Earlier Tuesday, local media reported a blast had hit the Baku-Tbilisi-Erzurum pipeline, carrying gas from the Shah Deniz field in Azerbaijan, in Turkey’s Kars province. "This night at 01:15 [22:15 GMT] there was a diversion at the Baku-Tbilisi-Erzurum in the… province of Kars. We see the intention by the terrorist separatist group [PKK] to encroach on the needs of our citizens living in the region, leaving them without a source of energy. This will not go unpunished," Yildiz said in a statement. 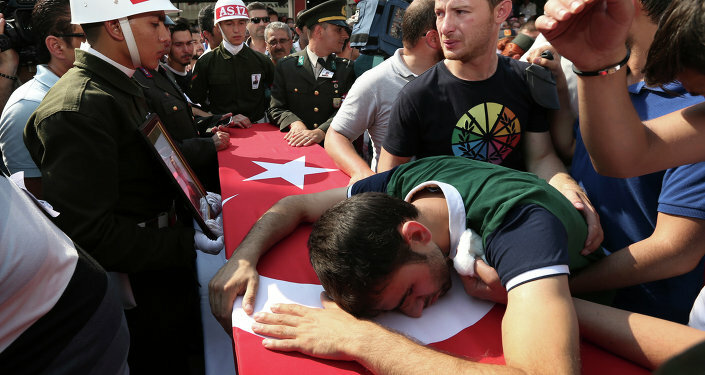 Last month, Turkey launched a military campaign against the PKK in northern Iraq, following the death of two police officers in the southern city of Ceylanpinar. The group stated that the policemen were supporters of the Islamic State militant group. Since then, the PKK is reported to have staged several attacks in the country, including July’s attack on a gas pipeline between Turkey and Iran. The PKK was founded at the end of the 1970s to fight for Kurdish self-determination. The group is considered a terrorist organization by Ankara.